Ålesund (Norwegian pronunciation: [²oːləsʉn] ( listen)) is a town and municipality in Møre og Romsdal County, Norway. It is part of the traditional district of Sunnmøre and the centre of the Ålesund Region. It is a sea port and is noted for its concentration of Art Nouveau architecture. The town of Ålesund is the administrative centre of Ålesund Municipality, as well as the principal shipping town of the Sunnmøre district. The 99-square-kilometre (38 sq mi) municipality is the 382nd largest by area out of the 422 municipalities in Norway. Ålesund is the 17th most populous municipality in Norway with a population of 47,199. The municipality's population density is 506.6 inhabitants per square kilometre (1,312/sq mi) and its population has increased by 14% over the last decade. The greater Ålesund urban area has a population of 56,223 (this also includes most of neighbouring Sula, Møre og Romsdal as well). On 1 January 2020, the municipality of Ålesund is scheduled to be merged with Haram Municipality, Skodje Municipality, Sandøy Municipality, and Ørskog Municipality to form one large municipality of Ålesund. Legend has it that Gangerolf (outside of Norway better known as Rollo), the 10th-century founder of the dynasty of the dukes of Normandy, hailed from the community of Giske, north-west of Ålesund. At least three statues of Rolle exist: in the town park in Ålesund, in the city of Rouen, France, and in Fargo, North Dakota, United States. Situated 236 kilometres (147 mi) north northeast of the city of Bergen, Ålesund is adjacent to the Hjørund and Geiranger fjords, the latter being on UNESCO's list of World Heritage Sites. The municipality covers an area of 93 square kilometres (36 sq mi). The population (2017) is 47,199, making the population density of 506.6 inhabitants per square kilometre (1,312/sq mi). The population of the agglomeration, which includes parts of the neighbouring Sula Municipality, is 48,460. The municipality also contains three smaller separate urban areas on the island of Ellingsøya: Hoffland, Årset, and Myklebost with a total population of 1,279. Other villages include Løvika and Spjelkavik, both on Uksenøya. Ålesund has a temperate and heavily moderated oceanic climate (Köppen Cfb). Winters are mild, damp and windy; the coldest month of the year, January, has a mean temperature of 2 °C (36 °F). The lowest temperature ever recorded at Ålesund Airport, Vigra was −11 °C (12 °F). The climate is extremely mild for the latitude and inland areas at similar parallels especially in lowland Sweden see much hotter summers and colder winters. The warmest temperature ever recorded in Ålesund is 34,4 °C (94 F°). The following climate data is from Ålesund Airport Vigra, on an island in the sea off Ålesund in Giske municipality. Ålesund itself is more sheltered and has warmer summers. All municipalities in Norway, including Ålesund, are responsible for primary education (through 10th grade), outpatient health services, senior citizen services, unemployment and other social services, zoning, economic development, and municipal roads. The municipality is governed by a municipal council of elected representatives, which in turn elect a mayor. To the east of Ålesund lies the Sykkylven Municipality where the Ekornes factory, producing furniture such as the StressLess chair, is located. Håhjem, another village near Ålesund, contains the headquarters of the Stokke company. Ålesund is also one of the harbours at which the Hurtigruten arrives two times per day. 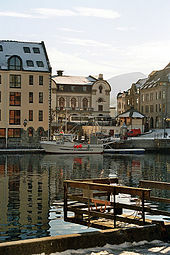 As the cultural center of the region and with close proximity to the fjords, Ålesund is a tourist attraction. The Atlanterhavsparken aquarium is another tourist attraction. The town's airport, Ålesund Airport, Vigra, has several daily flights to/from Oslo, Bergen, Trondheim, and Copenhagen. It used to have several weekly flights to/from Riga (Riga International Airport) (AirBaltic) and London (London Gatwick Airport) but these routes have since ceased. In November 2012 KLM announced it would fly to Ålesund 5 days a week from Amsterdam starting in April 2013. Lately, there have been suggestions[clarification needed] of a high-speed rail link to Oslo, Bergen, and Trondheim, as well as metro-style local services to meet the needs of the expanding population of the town. Sunnmøre museum, founded in 1931, is an outdoor folk museum devoted to the Norwegian coastal culture and way of life. Located on an area of 120 hectares (50 acres), it has more than 55 old and distinct houses from the past 300 years moved to the site, replicas of old Viking ships, and the Medieval Age Museum with artifacts from excavations of the old trading centre. Ålesund is home to a sub-division of the Norwegian University of Science and Technology (NTNU), with approximately 1,800 students and 150 employees. The Ålesund School of Art (Norwegian: Ålesund Kunstskole) is a school for visual arts located in Ålesund. The Norwegian School of Management had a campus in Ålesund, but it closed on 1 August 2008. Ålesund also features an International school for children aged 5–15. View of Ålesund on a sunny day from Aksla. The local football team, Aalesunds Fotballklubb ("Aalesund's Football Club"), (AaFK), was founded in 1914. The team played in the Norwegian top flight for the first time in the 2003 season. The club won its first Norwegian Cup in 2009 and won again in 2011. They played their home matches at Kråmyra Stadium until the 2005 season, when they relocated to the new Color Line Stadium, located approximately 1 kilometre (0.62 mi) outside the town centre. AaFK's supporter club is called "Stormen" and has about 2,000 members. ^ Statistisk sentralbyrå (2017). "Table: 06913: Population 1 January and population changes during the calendar year (M)" (in Norwegian). Retrieved 2017-10-19. ^ a b c Statistisk sentralbyrå (1 January 2012). "Urban settlements. Population and area, by municipality". ^ "Nye Ålesund" (in Norwegian). Retrieved 2017-10-19. ^ "Betydningen Ålesund" (in Norwegian). Ålesund kommune. 2007. Archived from the original on 2009-02-17. Retrieved 2007-10-16. ^ "Ålesund". Heraldry of the World. Retrieved 8 October 2011. ^ "Historical journey in the Municipality of Aalesund". www.alesund.kommune.no. 2010. Retrieved 2010-10-10. ^ "West Norwegian Fjords – Geirangerfjord and Nærøyfjord". UNESCO. Retrieved 2007-10-16. ^ "Normaler for Ålesund" (in Norwegian). Meterologisk institutt. 2007. Retrieved 2007-10-16. ^ "Climate: Ålesund, Norway". Retrieved 30 March 2016. ^ "Ålesund & Sunnmøre". Visit Norway. Retrieved 22 January 2019. ^ "The Times & The Sunday Times". thetimes.co.uk. Retrieved 28 March 2018. ^ "KLM to launch scheduled service to Ålesund". klm.com. Retrieved 28 March 2018. 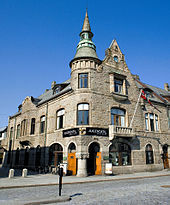 ^ "Sunnmøre Museum, Aalesund". sunnmore.museum.no. Retrieved 31 August 2017. ^ "Om BI Ålesund" (in Norwegian). Retrieved 2007-10-16. ^ Ivar Gunnar Braaten. "Ja til Latinskolen" (in Norwegian). Archived from the original on 2008-01-12. Retrieved 2007-10-16. ^ "Twin towns and Sister cities Ålesund". Ålesund kommune. 2010. Retrieved 2010-10-12. Look up Ålesund in Wiktionary, the free dictionary. Wikivoyage has a travel guide for Ålesund. Wikimedia Commons has media related to Ålesund. Wikisource has the text of the 1911 Encyclopædia Britannica article Aalesund. "Ålesund" . New International Encyclopedia. 1905.